Willians Astudillo helped lift Rochester to a win tonight, going 2-for-4 with an RBI and a pair of runs scored. Tomorrow he'll be back with the Twins, thanks to an injury to Bobby Wilson. Also tonight in the minors, Andy Wilkins hit a home run in extras for Chattanooga and 2018 draftee Andrew Cabezas pitched a gem for E-Town. Come check out what else happened across the system Thursday. Transactions – Andrew Vasquez promoted from Chattanooga to Rochester, Casey Crosby activated from the DL in Chattanooga. Some early run support and a strong pitching performance from the whole of the Red Wings staff kept the game well in hand all night. “Starter” Nick Anderson pitched the first inning, scoreless, giving up a hit, a walk, and striking out a pair, before being replaced by Zack Littell. Littell went 5 2/3 innings, struck out six, walked none, gave up six hits and also kept Pawtucket off the board. Andrew Vasquez gave up a run over 1 1/3, but the Red Wings were ahead 5-1 when Ryan Eades came in to pitch the ninth. Eades gave up a hit and struck out a batter in his full inning of work. 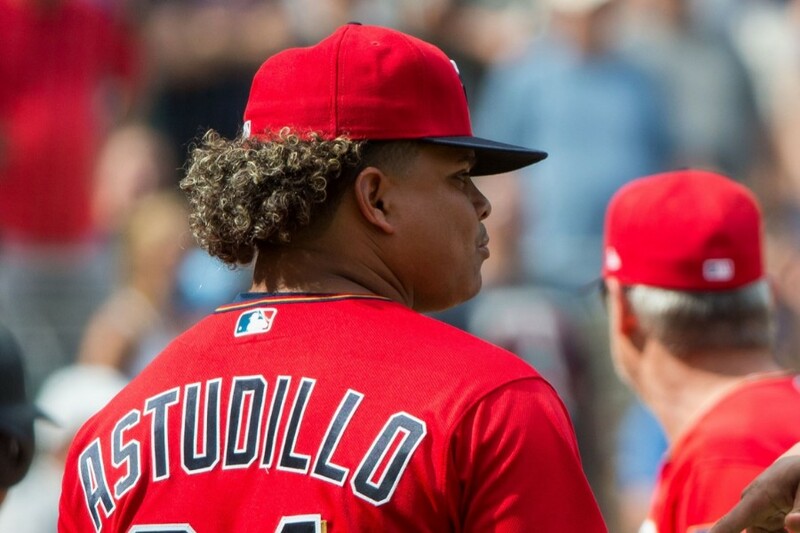 Willians Astudillo was 2-for-4 with a pair of singles, two runs scored and an RBI. Kennys Vargas stayed hot, 2-for-4 with a double, an RBI, a run scored and a pair of strikeouts. Jon Kemmer added a pair of hits as well, 2-for-4 with a home run, two RBIs and a strikeout. Nick Gordon was 0-for-3 with a walk and a strikeout. Gordon is hitting just .208/.251/.281 in 88 games for Rochester. The Lookouts were down 0-2 heading to the top of the ninth inning before putting a couple runs on the board to extend the game to extra innings, and then scored another pair of runs in the top of the 10th to win the game on a Andy Wilkins two-run home run. The inning before, Luis Arraez picked up the other two RBIs. The rest of the roster had just four hits and while Brent Rooker has crushed the Southern League and heading into Thursday game he was in the top three in RBIs (1st, 77), doubles (T-1st, 31), home runs (2nd, 22), hits (2nd, 122), extra-base hits (2nd, 57), total bases (2nd, 227) and slugging percentage (3rd, .490), he struggled on Thursday. Rooker was 0-for-3 with a walk. On the bump, Sean Poppen went five innings and gave up just a run on three hits and three walks and struck out six. Cody Stashak saw his scoreless inning streak end at 18 giving up a run in the first of his two innings of work. Austin Adams earned the win with two scoreless innings of relief and Williams Ramirez earned his seventh save of the year with a nice clean 10th inning. Thursday night was the rubber match in the three game set between Palm Beach and Fort Myers and the last game of year between the two. Fort Myers lost the previous three series this year and are now 4-11 against them. If the Miracle make playoffs they will face Palm Beach. Going into Thursday’s game Alex Kirilloff leads all of MiLB in hits (164) and XBH (67) but went 0-for-4 and only added to his strikeout total with two more on Thursday night. Ryan Costello was 2-for-4 with a solo home run, and Jose Miranda had a pair of hits as well, 2-for-4. On the bump, Bryan Sammons went 4 2/3 innings and gave up five runs on eight hits, and two walks. Colton Davis held off Palm Beach for 1 1/3 innings before Alex Robinson gave up a home run to the only batter he faced. Kevin Marnon finished the game with two scoreless innings. Cedar Rapids had a 4-3 lead after six and a half innings but Beloit put up two in the bottom of the seventh to take the lead for good. Trey Cabbage had a pair of hits as part of his 2-for-3 night that include a walk, an RBI and a run scored. Andrew Bechtold had a pair of hits and RBIs, going 2-for-4 with a pair of strikeouts as well. Starter Melvi Acosta gave up three runs over 4 1/3 innings on seven hits but he did manage five strikeouts. Jose Martinez was tagged with the loss giving up those two late runs. He pitched 2 2/3 innings and gave up two runs on three hits and two walks. He struck out a pair. Moises Gomez pitched the eighth and gave up a pair of hits but no runs. In Elizabethton the hometown Twins committed three errors and gave up six runs in the last two innings to spoil what had been a very tight ballgame. Jean Carlos Arias was 2-for-4 with a strikeout and Ricky De La Torre was 2-for-3 and only one other batter had a hit, Yunior Severino who was 1-for-4 with a solo home run. As a team the Twins had just five hits and one walk against 10 strikeouts. Andrew Cabezas pitched well over 5 1/3 innings giving up just a single run, a single hit, two walks and he struck out seven. Tanner Howell went 2 2/3 innings and gave up four runs on three hits and two walks. Juan Gamez was tagged with a couple of unearned runs in the ninth inning. Please feel free to ask any questions and discuss Thursday's games. Lewis is on a cold streak lately. At least the K's aren't high. Yup, he's 4 for his last 31 (7 games) and 2 for his last 21 (4 games). Nothing to worry about... but that FSL can drain guys... we also forget that he and Kirilloff are finishing up their first full MiLB seasons... they've got to be wearing down... Not as an excuse, but it would be understandable.Then again, they have like 10-11 games left, they could each get 20 more hits and we won't be surprised. Ha! Nothing official yet on Wilson/Astudillo, though it does make sense. I'm sure we'll hear in the morning when that early-morning Rochester to Minneapolis direct flight gets here. On base streak by Kiriloff comes to an end. Is Nick Anderson the only reliever being tried out in this "Opener" role? I can't recall anyone else yet. Not sure if this represents an actual strategy on the part of the organization, or just something unique about this pitcher's repertoire that suggests him for such a role. Looks like Mollie will have to actually play Astudillo behind the dish. That will be a fun game to watch. Most of the AA and AAA relievers have been doing this over the past month or two.So yes it seems to be an organizational strategy, probably not something they'll implement in the majors next year but they're clearly preparing their high minors relievers (and starters) to be used to it, so it seems likely that they'll want to try it with the big league club sometime in the future. If your relievers are good enough then I can see the utility, since your reliever gets to face the other teams best hitters the first time through the order, and once you get to the third time through the order they've still only seen your actual starting pitcher once.Your 4th and 5th relievers have to actually be better than your starting pitcher for the opener to make sense though.I feel like there have been quite a few runs scored off of the AA and AAA openers, though probably less than I think given I probably mostly only notice the times it doesn't work great. I was curious about your comment about Kirilloff, "and only added to his strikeout total with two more. "Although accurate, it would make the casual reader think he strikes out a lot.That was surprising to me, so I checked.With 35 K's at Fort Myers, his strikeout rate is about 15%, which is rather good for any hitter...at least in my opinion. Good to see Vasquez moving up to AAA even though his first appearance didn't go all that well.I still don't understand why he spent so much time in A+ this year but once he proves that his repertoire works on AAA hitters it's just a matter of time before he gets a taste of the big leagues. once you get to the third time through the order they've still only seen your actual starting pitcher once.Your 4th and 5th relievers have to actually be better than your starting pitcher for the opener to make sense though. Yes, and I'll go farther. If your starter is of a caliber where third-time through is a concern (and it is indeed, for probably a majority of starters), then it's a certainty there will be relievers. Those relievers may or may not be "better", but they will be in the game, one way or another, and one of them will perforce be facing the top of the opposing lineup at some point, or probably two or even three. The manager might as well pick his spots in this way. I'm a big believer in the concept of starting with a short-man, preferably one with a different style (and opposite arm) of the nominal starter, to give the other guys a totally different look to think about. Interesting syntax, right? I thought the same thing at first read, but then took it to mean that the only counting stat AK added to was his K total...on this night, for the first time in a long time, he didn't even add a BB. Royce and Alex are probably exhausted! I suspect neither will go to Arizona because of that. It’s a phase. A few baseball clubs found success by having a close start a game. I don’t mind the experimentation. Wow, I just wrote a sentence that involved the Twins’ organization experimenting. I hope I am wrong, but boxscores seem to suggest that many MiLB players are exhausted. Bryan Sammons comes to mind. Most recent starts #6-10 his era was sub 3. Most recent starts 1-5 the ERA is above 8. They bring up a catcher they don't let catch. Seems odd, to me. We are entering "fall training" period. May as well take a look at prospects instead of suspects. Looks like Sammons hit the DL. It's one of the reasons not to have pushed them up to AA this season. Letting them get through the year of full-season ball like this isn't a bad thing. It's not like either is old for the level. Kirilloff has cooled off some, so it will be interesting to see how he controls the strike zone going forward now that he's not hitting everything in the world. I suspect hell be just fine. Think either are AFL candidates?